On the eve of Chinese President Xi Jinping’s visit to India, Tibetan Women’s Association (TWA), the largest women’s political organization in exile, while wishing Shri Narendra Modi ji a happy 64th birthday, urges the Indian Prime Minister to raise the crucial issue of Tibet with his Chinese counterpart. TWA calls on Xi Jinping to face the Tibet Challenge by holding talks with the Tibetan leadership in exile, particularly with the envoys of His Holiness the Dalai Lama. 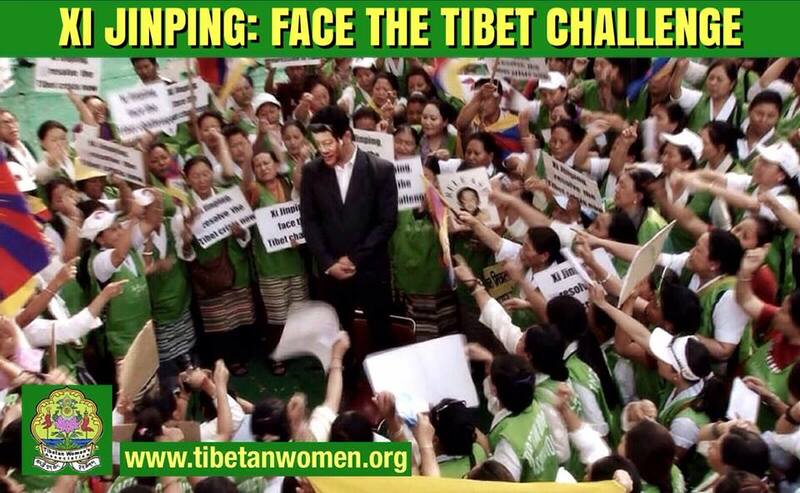 On the eve of Xi Jinping’s India visit, TWA is re-releasing a campaign video titled #Xi Face the Tibet Challenge. This campaign was initially launched on March 14, 2013, the day Xi Jinping formally assumed the Chinese presidency. Over 200 Tibetan women representing 33 regional chapters of TWA staged the campaign at Jantar Mantar, New Delhi with three key slogans: Xi Jinping, end the repression in Tibet, Xi Jinping, resolve the Tibet crisis now, and Xi Jinping, face the Tibet Challenge. “Sadly, over the last 18 months, we didn’t see the Chinese Government under Xi’s leadership address the legitimate grievances of Tibetan people inside Tibet,” said Ms. Tashi Dolma, President of TWA. The situation in Tibet is exacerbated by a deepening crackdown by the Chinese government on any forms of peaceful expressions for freedom by the Tibetan people, thus deepening the anguish Tibetans feel. Human rights situation in Tibet is marked by deterioration of rights protection and an intensification of clampdowns. There have been arbitrary shootings, arrests, and the indiscriminate use of force – actions which have reduced Tibetans to the level of a subject people. The denial of religious freedom and large-scale government sponsored settlements by non-Tibetans threaten to obliterate Tibetan identity. For the last 18 years of TWA’s history in exile, TWA has been calling on the Chinese government to peacefully resolve the issue of Tibet. But their stringent and repressive policies have engendered a forbidding situation that has spiraled a spate of self-immolations inside Tibet, of 131 Tibetans including 21 Women. A week prior to Xi Jinping’s India visit, TWA has submitted appeal letters to the Indian Prime Minister and the Indian Minister for External Affairs urging them to raise Tibet. TWA leaders will also engage in a two-day direct lobby campaign with the Indian leaders.